Taking advantage of its reputation as one of the best places for new musical artists to win fame, Spotify has announced it will help promote emerging artists directly with a new program called RISE. Its goal? To "identify and break the next wave of music superstars." The 50-million subscriber-strong streaming service intends to do this by releasing special RISE playlists, introducing artists with video interviews that tell their backstories, and hosting other vaguely described events. Delta Airlines is even in on the action, and it will soon start showing RISE artists in spotlight shorts on the backs of airplane seats. Just don't get the impression that Spotify might be interested in your garage band. 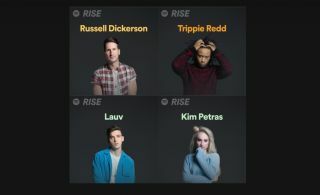 Spotify mainly chooses which artists it will promote for RISE by studying who's already trending, so it's less a true discovery system and more a way of calling attention to artists who are already making waves. The first four artists involved, at least, already have record deals. There's Lauv, for instance, who already ranks as one of Spotify's most popular artists, and German pop singer Kim Petras already has a massive following. Country singer Russell Dickerson released an album earlier this month from the Triple Tigers label. Last, but not least, hip-hop artist Trippie Redd has already been featured on Spotify's noteworthy Rap Caviar playlist. Once the program gets in full swing, Spotify hopes to highlight 16 different artists per year at a rate of four per season. All in all, RISE appears to be a largely good-natured promotional effort. In an interview with Billboard, Troy Carter, Spotify's global chief of creator services, said that Spotify will own no copyrights associated with the artists and wouldn't make any money from merchandise or tours.